This seriously sounds as amazing as it was!! If you love pork chops this keto breading takes them to the NEXT LEVEL! The perfect blend of crunchiness with the utmost tender pork chop you will ever eat. I typically cook pork loin on the stove top, in a skillet, with no breading. I decided to try something different and MAN am I glad I did?! If you have a cast iron skillet, that’s the way to go. If not, don’t despair… you can still make this delicious chunk o’ meat and enjoy it just the same. Here’s a quick video with the steps involved in breading the pork loin in case you need a visual or just want to watch something that makes your mouth water until you get a chance to actually make em’! Heat a cast iron skillet on the stove top with a few tablespoons of avocado oil over medium heat. If you do not have a cast iron skillet, a large baking sheet sprayed with oil can be used instead. Use a food processor to finely grind pork rinds. Add ground pork rinds and almond flour to a plate or large dish, spread out mixture evenly and set aside. In a separate bowl whisk together eggs and seasoning to make an egg wash.
Dip each pork chop in the egg wash making sure to coat each side by flipping the pork chop. Take the pork chop out of the egg wash then place it into the almond flour/pork rind mixture. Coat each side of the pork chop evenly with the mixture. 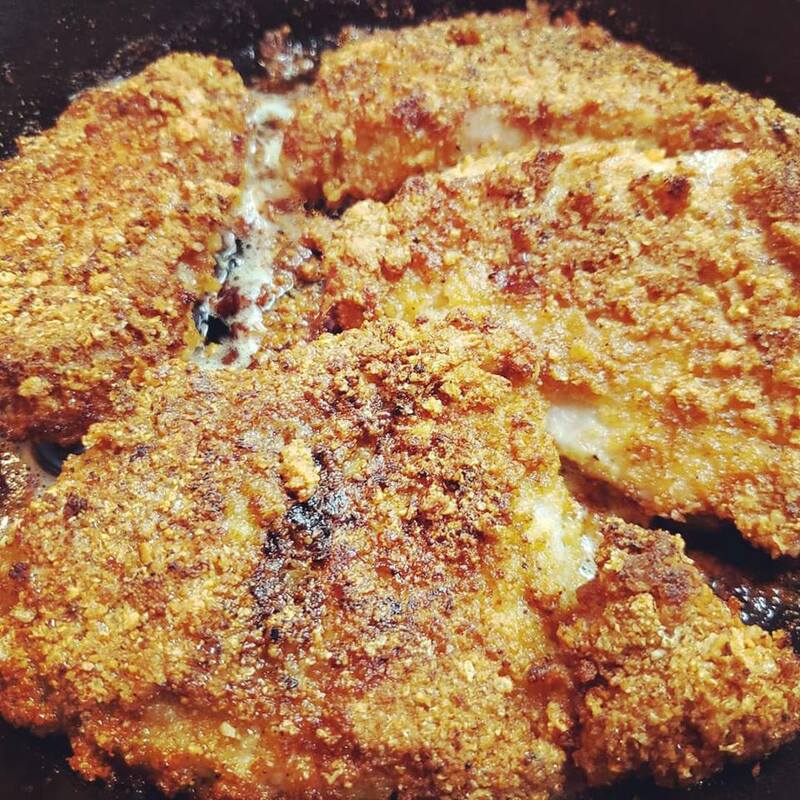 Place breaded pork chop into the cast iron skillet (be sure the oil is hot so it will immediately start to crisp the breading). Bake for 12-15 minutes on one side then remove from oven and flip each pork chop over to brown on the other side. Return to oven and bake for another 10 minutes, until golden brown and crispy. I can’t wait to try this keto breading with some chicken tenders! Let us know in the comments if you make it!